During the lengthy process of pharmaceutical development, an Active Pharmaceutical Ingredient (API) or its intermediates can go through many physical and chemical changes. These changes are needed to produce the API with the correct chemical structure and physical property. Monitoring the progress of these transformations is important for the process understanding as well as serving as a tool for in-process control (IPC) to ensure the completeness of the transformation. IR and Raman Spectroscopies are sensitive to both chemical and physical changes of a compound and have evolved into useful tools in our lab for monitoring both chemical and physical transformations. They can be used to monitor the progress of the chemical reaction leading to the desired product, the slurry-to-slurry form transformation leading to the desired crystalline form, and the instability of API leading to undesired degradant. When used in-line, they can also be used to study the kinetics of a chemical reaction as well as the rate of crystalline form conversion. They have been used as an IPC for chemical reactions and a tool to monitor dehydration form conversion during API drying. 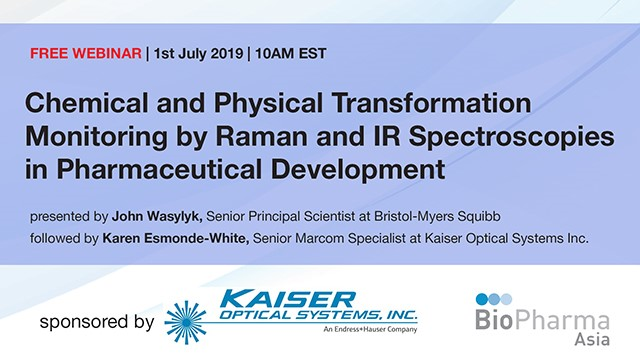 We will present a wide range of examples to illustrate the versatility of these spectroscopy tools for the chemical and physical transformation monitoring.